The BBB – the Babich Barbel Bugger – is a revelation of a fly for targeting the African Sharptooth Catfish, more commonly known as the Barbel, originally tied by Terrence James Babich. Terry Babich is one of the most well known, and best fly fishermen in South Africa, and he has been catching Barbel on fly for a long time. Not just your average size Barbel, 20kg + fish! 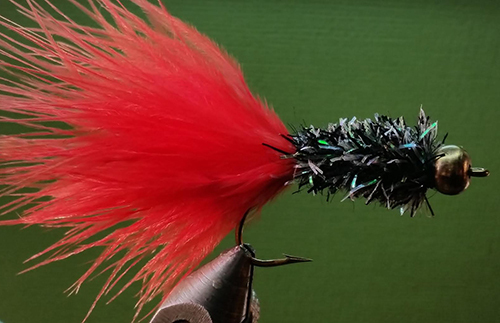 Terry Babich first started using and tying this fly in about 1994, and has not looked back. Terry Babich first used the BBB at Bloemhof Dam, and used the splashing technique (Also known as plonking or calling), by casting the BBB a few times into one spot quite hard, creating a disturbance in the water and then leaving it to sink. By that time the Barbel had come to investigate all the commotion in the water and were only too eager to attack the sinking Barbel Bugger. The success of this fly speaks for itself, and this is probably the best Catfish fly you could use in South African waters!